When the sun sets and night comes, children are taught to stay at home, lest creatures of the night like vampires come. 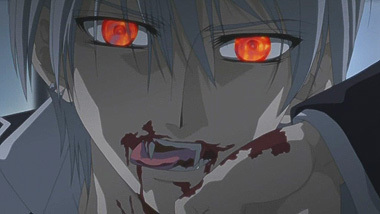 If vampires were real, then what would be a response? Does fear or intrigues at the unknown are considered. 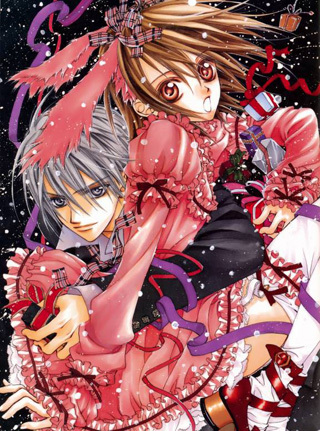 The premise of Vampire Knight is similar to many other vampire stories that exist, but there are differences that can lead you into enjoying this ongoing series. So donít just think of this story as a Twilight read-alike. The plot thickens as secrets are mentioned and what could happen if the secrets are revealed? 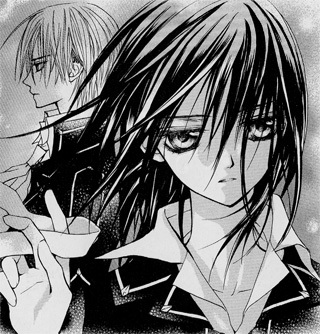 As the daughter of the Cross Academy's headmaster, Yuki is one of two Prefect and Guardian. 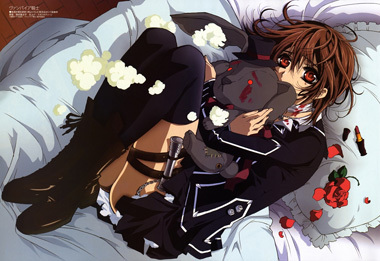 Alongside Zero Kiryu, she nightly patrols her school, since she is one of the few that knows of the truth dividing the student body into a Day Class and Night Class. The Night Class is comprised of gorgeous looking people, who are all vampires. 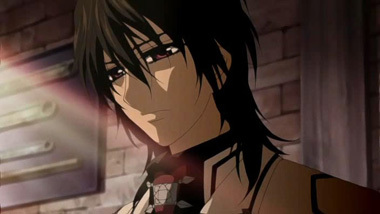 Yuki has an existing deep connection to the Night Classís leader Kaname. Now the only time these two groups meet are at dusk, and in a scene similar to being right out of Hana Kimi (Hanazakari no Kimitachi e), Day Class females ardently wait for a glimpse of the Night Class guys they crush on. 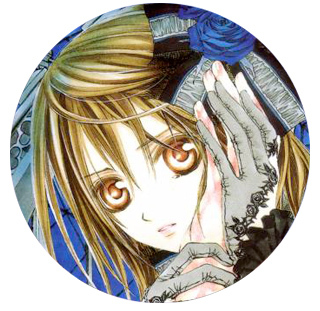 Matsuri Hino is a mangaka that has been able to have all her work translated into English. 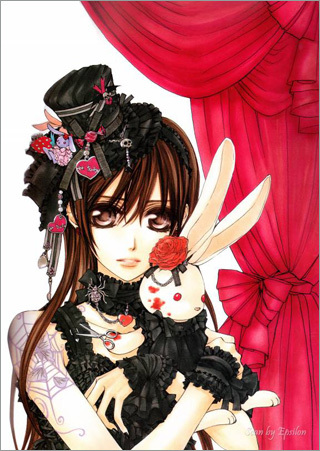 So if you have read Wanted, MeriPuri, and Captive Hearts before, Vampire Knight is her most popular title yet. 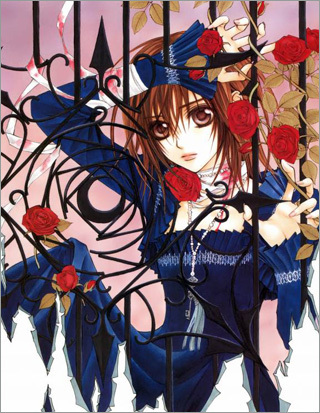 There are currently 13 books of this to be concluded manga series that has been released by Viz as part of the Shojo Beat imprint. Volume 14 will be released in print later this year. Viz Media has steadily been releasing its print properties into digital ones and as of now, the first and latest volume of this series is on there. 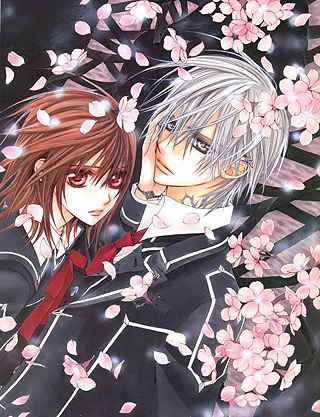 Vampire Knight is a series for readers who enjoy drama, tension, torrid pasts, and love triangles. When I mention that Twilight might not be similar read alike in spite of similar characteristics, how about consider Ayashi no Ceres, another title where the heroine would have paranormal occurrences and revealing secrets that made it a rich emotional story. 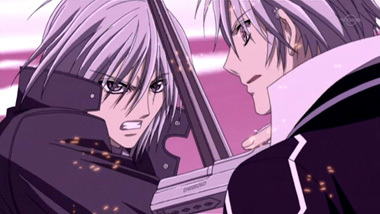 Vampire Knight definitely is not a series to miss, if you don't mind your heart pounding faster as you enjoy the tensions and conflicts that only a vampire story can provide. Is there no end to my supply of crack? I thought I was well on my road to recovery; I've been clean for a week more or less and I've had enough willpower to keep myself away from all the usual dangerous spots... Lo and behold, sometimes it is the most innocent place that you won't ever suspect of being your downfall. It's like feeling the shakes coming on, fighting it so hard, only to find out your squeaky clean sweet little old lady across the hall is the neighborhood dealer. Oh, the humanity! I finally caught up on my sleep, the bags under my eyes have disappeared, my eyes are no longer bloodshot, and my ìshakesî from reading Bloody Kiss has finally subsided. My thoughts are no longer turning to re-reading the Twilight series. 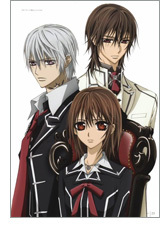 One click, that's all it took and I'm back to sniffing my glue, puffing my roach, and shooting my heroin: Vampire Knight. 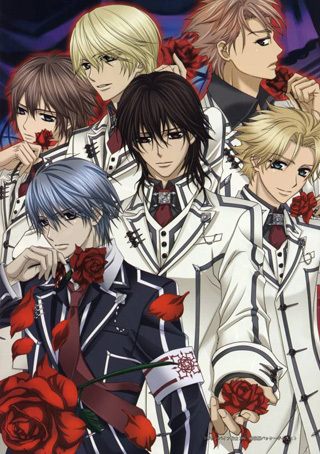 Black Blood Brothers, please meet The Wallflower, go to an elite high school, get rid of any funny stuff, and throw on a wee bit of a Death Note look; that'll bring you pretty close to what Vampire Knight is. Yuki is a happy go lucky high school student, just trying to keep the peace as a Disciplinary Council member. Everyone says that she's lucky that her father is the dean of the school and allows her to be a member but there are days when she would rather give it up and sleep a full night away. Her school is special; all the students live in dorms near the school and there are Night Classes and Days Classes but only one Disciplinary Council to control the two of them. It's like Lord of the Rings except everyone in Mordor is hot and Frodo is trying to get all of Middle Earth to play nice and co-exist peacefully. All the students in the Night Classes are vampires and smoking hot; all the students in the Day Classes are regular high school students. Normally, they wouldn't mix because once the Day Classes ends, theoretically, all Day students go back to their dorms and stay tight while the Night Classes wake up and go to class and vice versa. Somehow, word got out about the good looking guys and girls of the Night Classes and every day Yuki has to go pull enamored girls off the gates and walls that surround the dorms of the Night Class. Of course, that also means that every night she has to patrol the hallways and school grounds just in case some girls decide to stalk one of the Night Class or sneak a glimpse of their crush. Things are precarious enough maintaining peace as is; the school does not need anything to tip anything or anyone over edges. Yuki isn't the only one in the Disciplinary Council; sadly, it's a two person ìCouncilî with the other person usually late or slacking off somewhere. 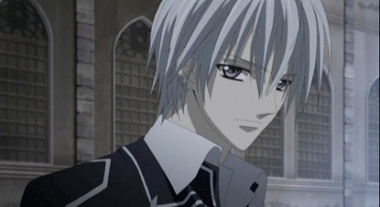 Zero Kiryu is almost like her older brother; they've been growing up together for the last four years since his family was wiped out by a Pureblood vampire. While Yuki is busy protecting both the classes, Zero is standing back to let things run their course. 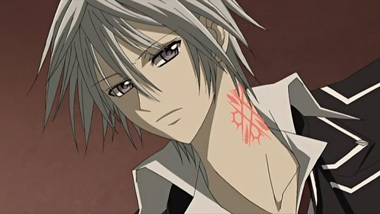 Coming from a family of vampire hunters and having them wiped out by one, he's just itching to for a reason to kill himself a few of them or a whole class of them. He's not going to let any human get kill, but he's ok with injuries as long as it is a good enough reason for the dean to let his trigger finger loose. 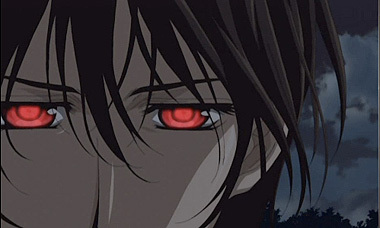 Preferably, he could kill the leader of the Night Class, Kaname Kuran, first and work his way down? Can he do it though? 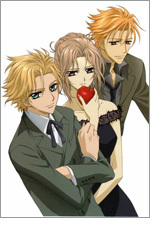 Kaname Kuran saved Yuki ten years ago and left her in the dean's care. It would break her heart if Zero killed him. 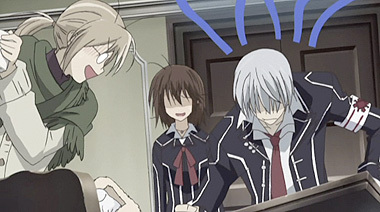 While Yuki and Zero are busy with their day to day duties and personal struggles, Kaname and the dean discuss the long term ideals of the school. Both of them believe that vampires and humans can peacefully co-exist as long the blood tablets that keep the thirst in check work. The only thing that they disagree on at the moment is whether or not Zero should be transferred to the Night Class. What?!? 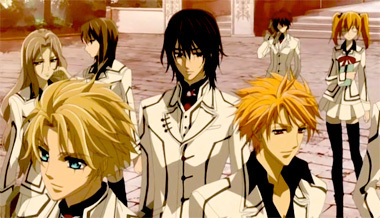 Why would Kaname think that having someone that wants to wipe out the entire Night Class should join it? Perhaps containing all the mayhem at night is a good idea. 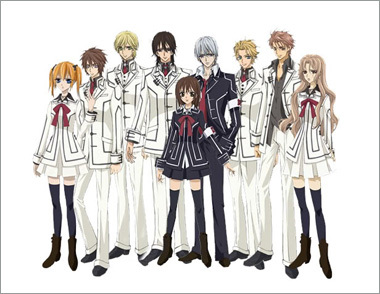 What would the Day Class and Yuki think of all the fighting, blood, and bared flesh? Oh my, summer is definitely here and it's hot. 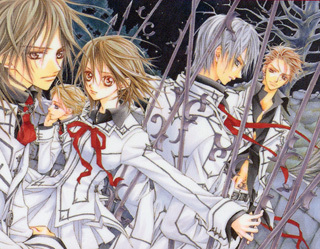 Below: Promotional illustrations for Vampire Knight. 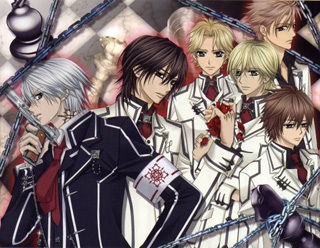 Below: Scenes from Vampire Knight. 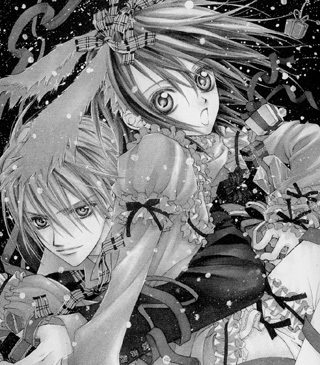 Below: Manga panels from Vampire Knight.